The Digipaks excels in functionality and design opportunities. It comes with different tray(s) for CDs or diskettes. This packaging can be used to incorporate pop-up messages and other special effects. 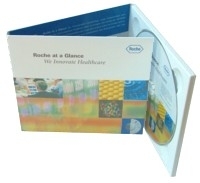 The DVD Version was specially developed for the fast growing DVD-video and DVD-rom market. Functionality and perfect opportunities for design are offered for DVD projects, which require special packaging for one or multiple DVD discs. What Special Artwork & Packaging does ADIVAN offer?